Julius Röntgen was a talented and productive composer. His extensive oeuvre of over 600 compositions include symphonies, concerts, chamber music for many different ensembles, songs, choral works and operas. In 1878, after spending his youth in Leipzig he accepted a position as head teacher at the Music School of the “Maatschappij tot Bevordering der Toonkunst”, Amsterdam. Since then he has left a mark on Dutch musical life, as a composer, pianist, conductor, concert promotor and educator. 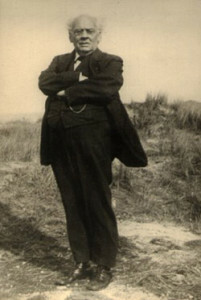 As a teacher and later as a director for many years, he became associated with the Amsterdam Conservatory, which he founded in 1884. In 1924 he retired from the Amsterdam music scene to the rural town of Bilthoven, in order to be able to concentrate fully on composing, with even greater passion. In the last period of his life, from 1924 to 1932, more than two hundred works were created. 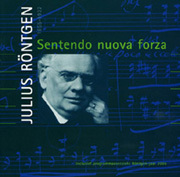 In November 2007 a biography about Julius Röntgen was published , written by historian-musician Jurjen Vis on behalf of the Julius Röntgen Foundation, which was founded in 2000 to commemorate Röntgen’s 150th birthday in 2005. The book is not arranged chronologically, but thematically. Partly based on diaries, notebooks and hundreds of letters, Jurjen Vis deals with Röntgen’s education, his friends, wives, musical partners, colleagues and pupils, successes and setbacks, his religion and his German background. In October 2007, Jurjen Vis obtained his doctorate on an extended version of the biography at the University of Utrecht. Jurjen Vis, ISBN 978 90 400 1870 5 (448 pages). A few copies are still available from the author. 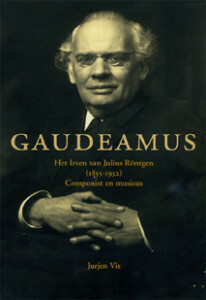 Earlier on, in the context of the Röntgen year 2005, and at the initiative of the Association of Family Members of Julius Röntgen, a programme book was published with detailed information about the composer and the activities that took place that year in Amsterdam, Bilthoven and The Hague. The title of this booklet, Sentendo nuova forza (sensing new energy), is taken from Beethoven’s String Quartet op.132. Röntgen used this motto as a title for his last composition, the Piano Quintet in G-major. It symbolizes his optimistic view of life. Order at the Nederlands Muziek Instituut. Meanwhile, the Julius Röntgen Foundation has been dissolved, after the main objective of publishing a biography has been reached. The Association of Family Members of Julius Röntgen is still active and is committed to the preservation of the cultural heritage of Julius Röntgen, in the broadest sense of the word.